The Shiny professional style for vBulletin 4 forums comes with Blue, Green and Red color schemes that are all well developed into a stylish add attractive design. These vBulletin premium forum skins are available with both fixed width and a fluid width version to better suit your specific needs and requirements. There is a step by step installation guide included in order to get things up and running quicker, even if you are new to vBulletin forum styling and themes. The header and footer of the theme are available in an easy to edit PSD file for quicker modification in order to quickly make things like for adding your own logo. So if you don’t want to be like the rest of the crowd that is still using the basic vBulletin forum style, then you can just get this alternative skin for your online community and make your forum look not only different, but also better than the rest. 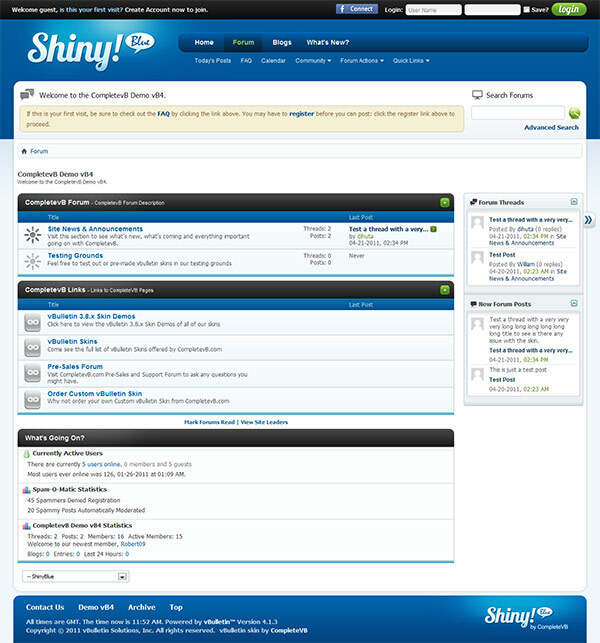 The Shiny Blue, Shiny Green and Shiny Red professional forum styles all come with 1 year free support & updates and work with vBulletin versions 4.1.1, 4.1.2 and 4.1.3. 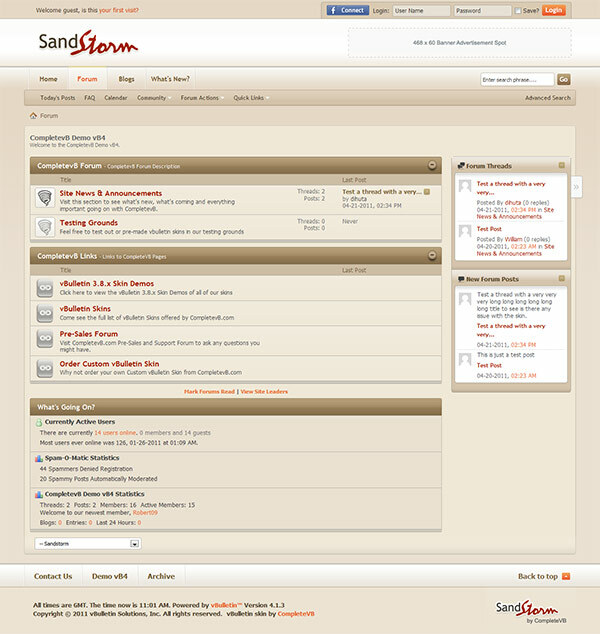 The Sandstorm professional style for vBulletin 4 forums uses a light brown color scheme that is well developed into a stylish add attractive design that is easy to read and navigate. This vBulletin premium forum skin is available with both fixed width and a fluid width version to better suit your specific needs and requirements. There is a step by step installation guide included in order to get things up and running quicker, even if you are new to vBulletin forum styling and themes. The header and footer of the theme are available in an easy to edit PSD file for quicker modification in order to quickly make things like for adding your own logo. So if you don’t want to be like the rest of the crowd that is still using the basic vBulletin forum style, then you can just get this alternative skin for your online community and make your forum look not only different, but also better than the rest. The Sandstorm professional forum style comes with 1 year free support & updates and works with vBulletin versions 4.1.2 – 4.1.3. 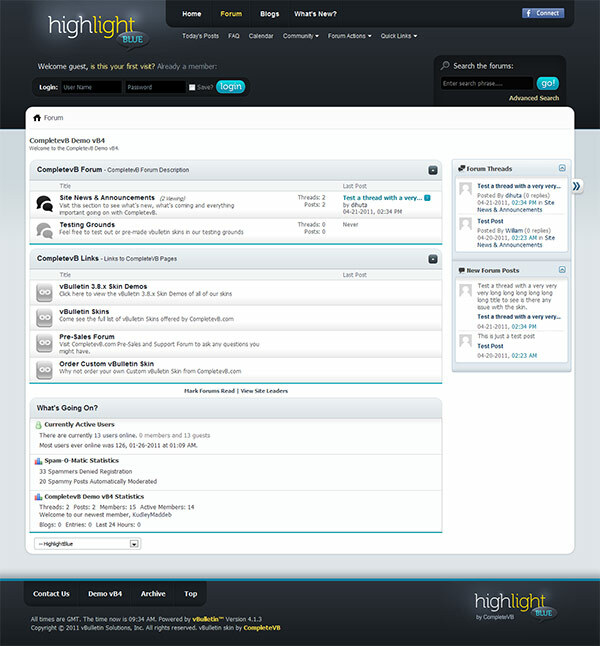 The Highlight premium style for vBulletin 4 forums uses a light color scheme using Blue, Green and Orange with dark header and footer that are all matched very well in an attractive design. This vBulletin forum style comes with fixed width as well as a fluid width version to better suit your specific website needs, there is also a step by step installation guide available to get things up and running faster and easier. The header and footer of the style are included in a PSD file for easier modification like for example adding your own logo. So if you don’t want to be like the rest of the crowd that using the standard vBulletin forum style you can get this alternative skin for your online community and make your forum look different. The Highlight Blue, Highlight Green and Highlight Orange professional forum style comes with 1 year free support & updates and works with vBulletin versions 4.1.1, 4.1.2, 4.1.3.